We are undertaking some Building works on level -1 Forum Library for the remainder of the summer vacation. Some works will be noisy and we are therefore recommending that levels 0 and +1 are preferred for study/research during this time. 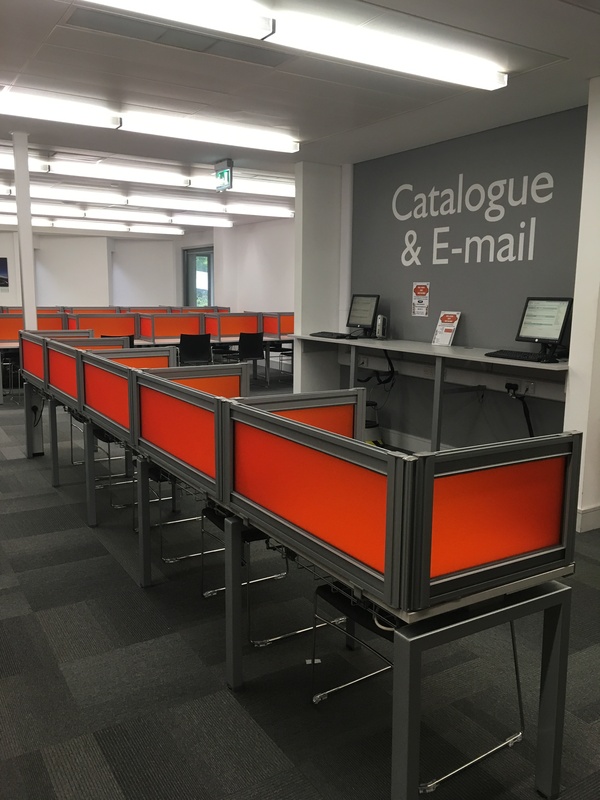 All library stock will remain accessible throughout the work, although a fetching service will be in place for two weeks for Law Library materials, in order to facilitate ventilation works. Full details below. 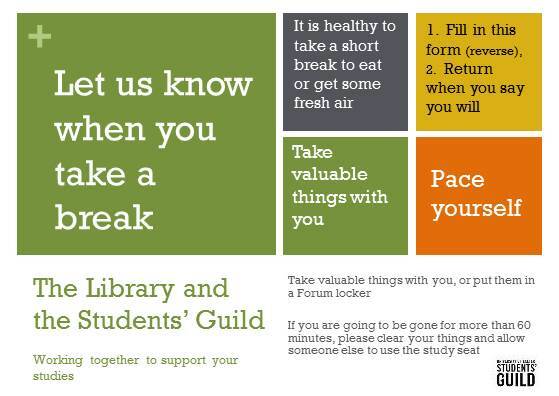 During this period, work will be taking place in the Law Library area to improve the ventilation system. This will ensure more pleasant environmental conditions for study and research for the coming term. Our student user feedback has highlighted the need for these improvements to take place. 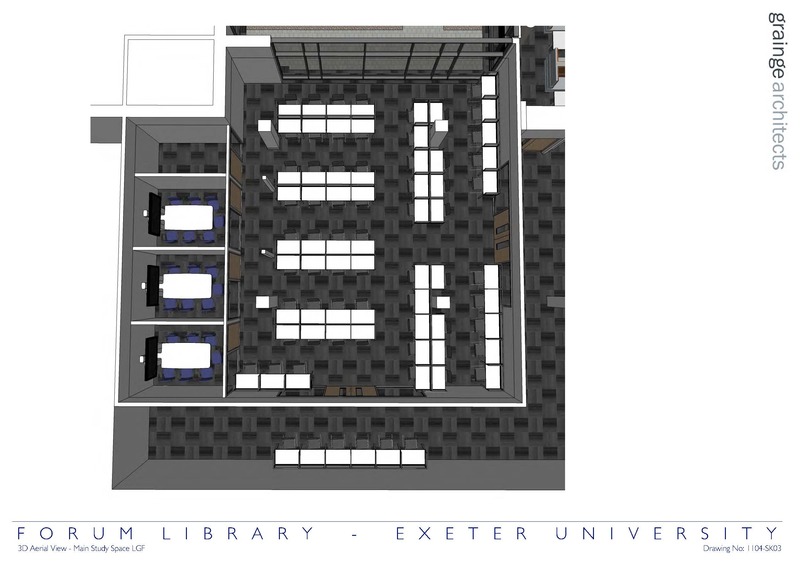 Some of the works will involve floor drilling so will be noisy in the areas adjacent to Law Library on Level -1. We recommend that library users make use of study space on Levels 0 and +1 for the duration of the works. The Law library study booths area (adjacent to the Library Courtyard) on Level -1 will be closed from 1st August 2016 over the summer vacation for refurbishment. 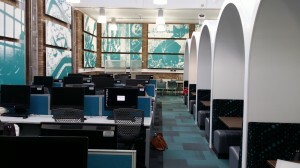 The newly refurbished space will reopen in time for the new academic session. 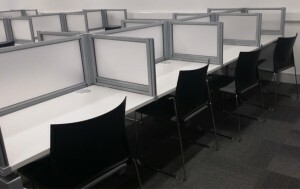 Student feedback has highlighted that the current use of the space is less than optimal as booths are monopolised for long periods of time, causing problems at busy periods. 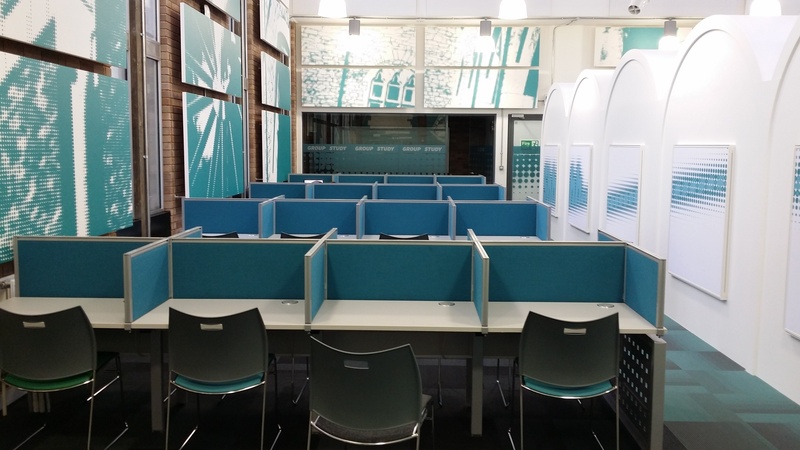 The space will be reworked to provide a different study space layout to address this issue and also to accommodate some bookable space in order to improve shared student access and use of the space. Some noisy work will take place during this refurbishment and we recommend that users make use of study space on Levels 0 and +1 for the duration of the works. 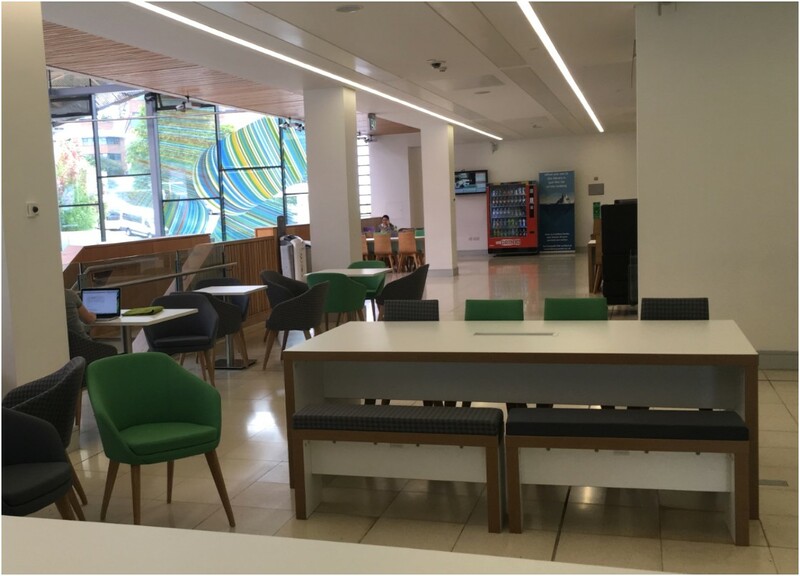 This entry was posted in Law, Study Spaces on 15th Jul, 2016 by Lee Snook. Are you gearing up for the exam season? So are we! 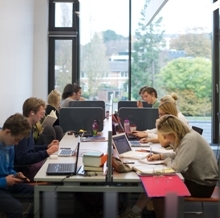 We know that study space provision is hugely important during the revision and exam period, so here’s a brief to guide to the study spaces that are available for you over the next month or so in the Library. Seminar Room access via the Library. The Forum Seminar Rooms on levels 0 and +1 will become part of the Library, further expanding the study spaces that are available to you 24/7. Remember to enter and exit these rooms via the Library (through the doors by the computer clusters) not via the Forum. 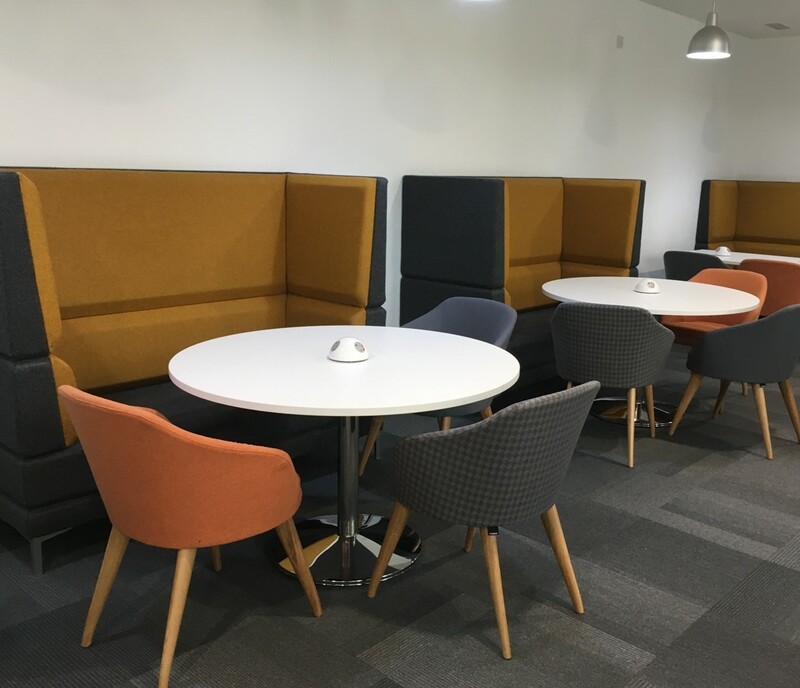 Don’t forget study seats are also available in the Student Services Centre, Forum Street Balcony, Forum Expo Labs and in many other buildings across our campuses. 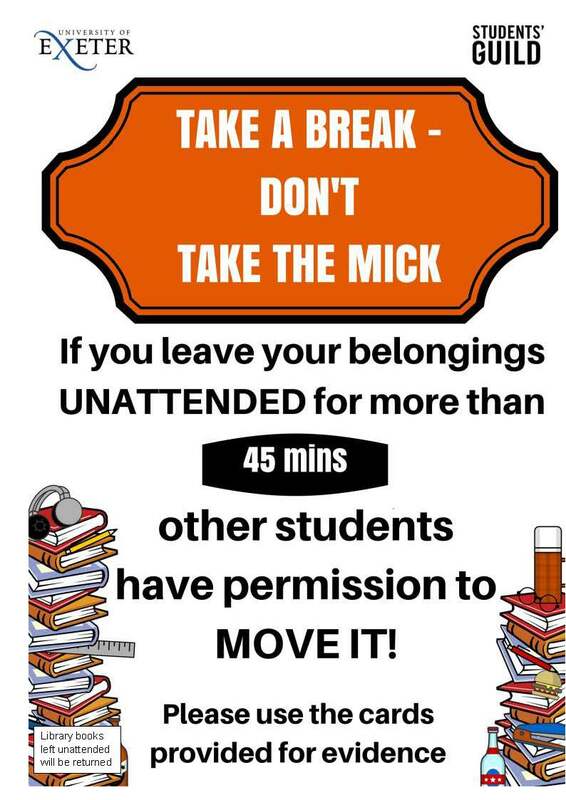 2] It is OK to take a break for about an hour (60 minutes) if you are working in the library for a long time; but always return promptly within one hour. 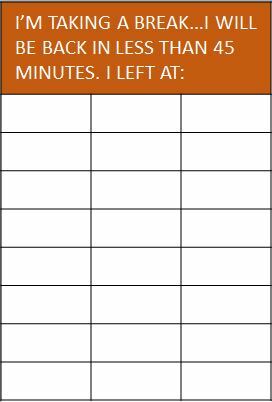 leave one of our cards so others know you are coming back. 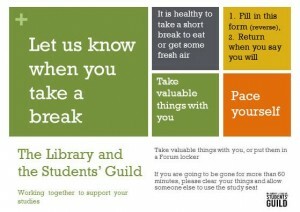 3] Remember the Library is a public space! Always take valuables with you or lock them safely in a Forum Locker. This entry was posted in Study Spaces on 26th Apr, 2016 by Susan Abbott. 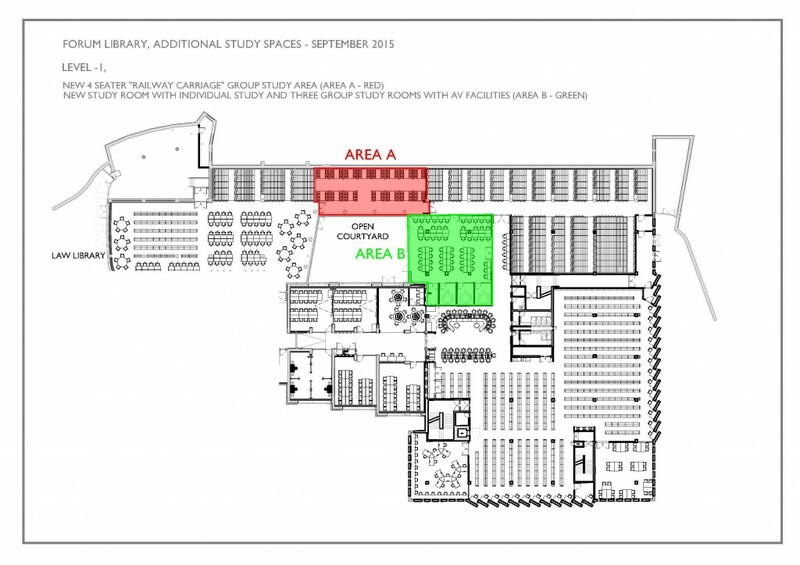 More study spaces added today! Good news – we’ve added an extra 30 study spaces to the Forum Library. The desks are temporary and will be upgraded (new furniture is being ordered). Most are on Level -1, but there are a few on the other floors as well. 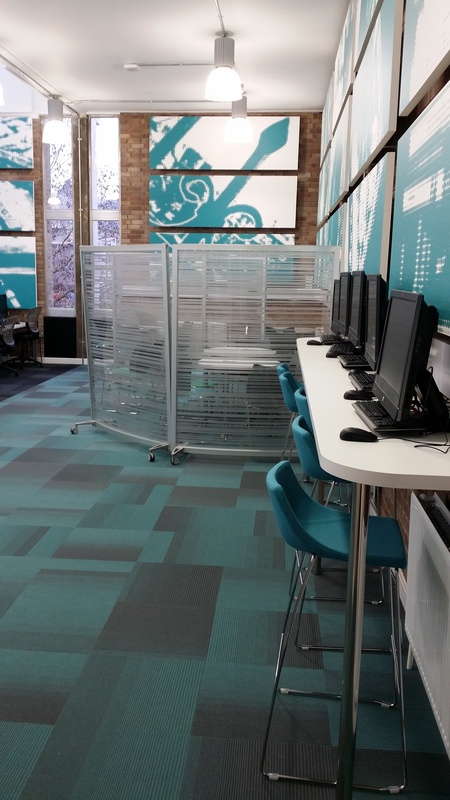 As well as these, there are some other higher height tables on the floors that could be used as standing desks for those of you who prefer it. 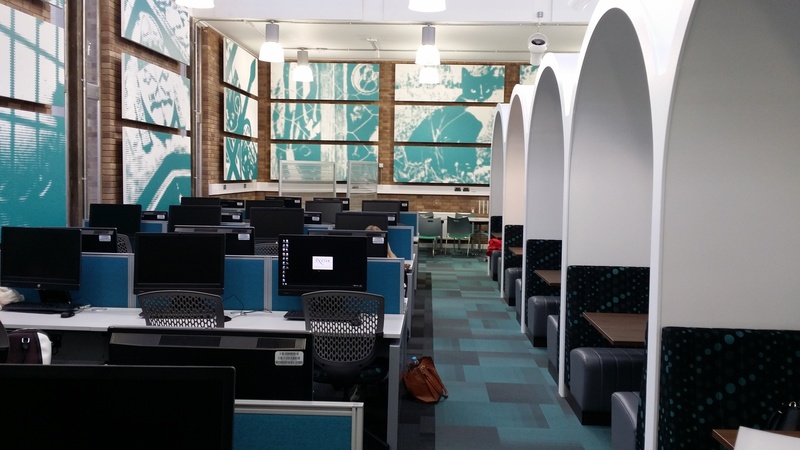 This entry was posted in Forum Library, Study Spaces on 23rd Oct, 2015 by cagale. 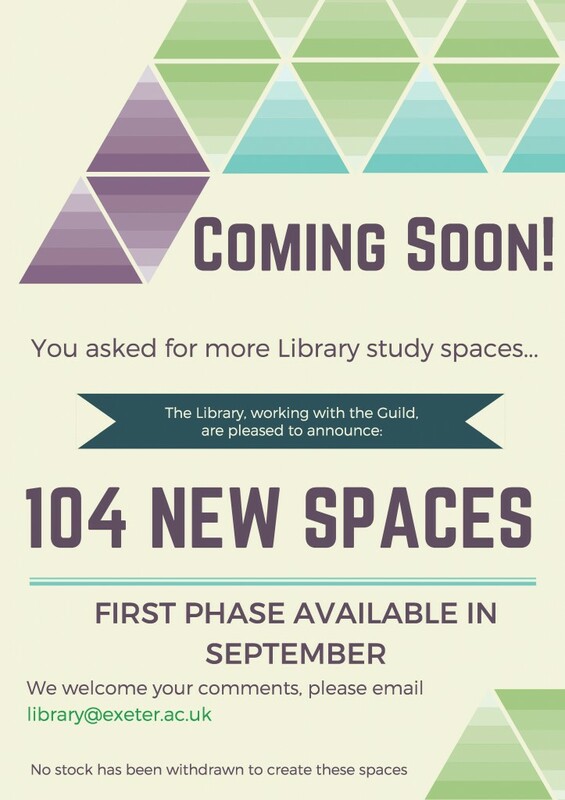 Over the next few months we will be working to put in more study spaces in the Forum Library. 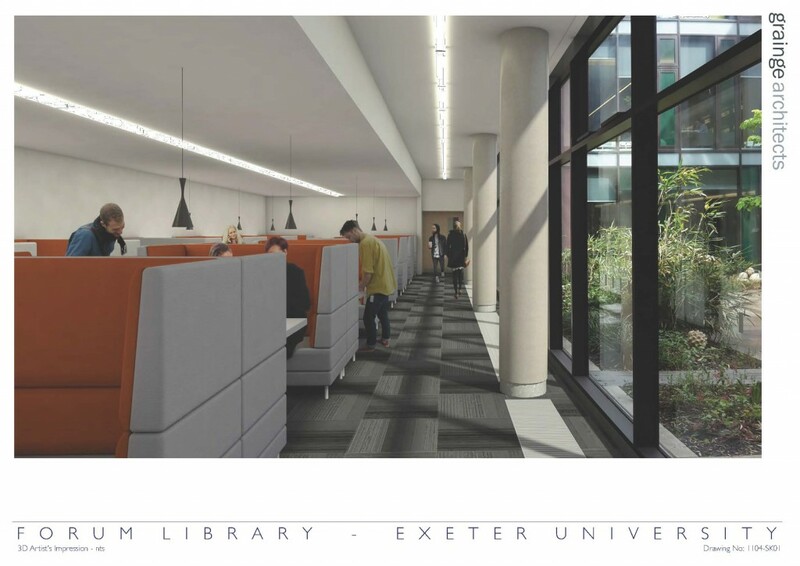 A total of 104 new spaces will go in which will include converting the current staff office into a study room with some bookable group study rooms and also creating some railway style study carrels alongside the Seal Courtyard Garden. Work on this will begin in August 2015 and go on into the New Year. Plans below should explain what we are trying to acheive over the coming months. An aeriel plan of the new study areas above and a 3D plan of the room below. 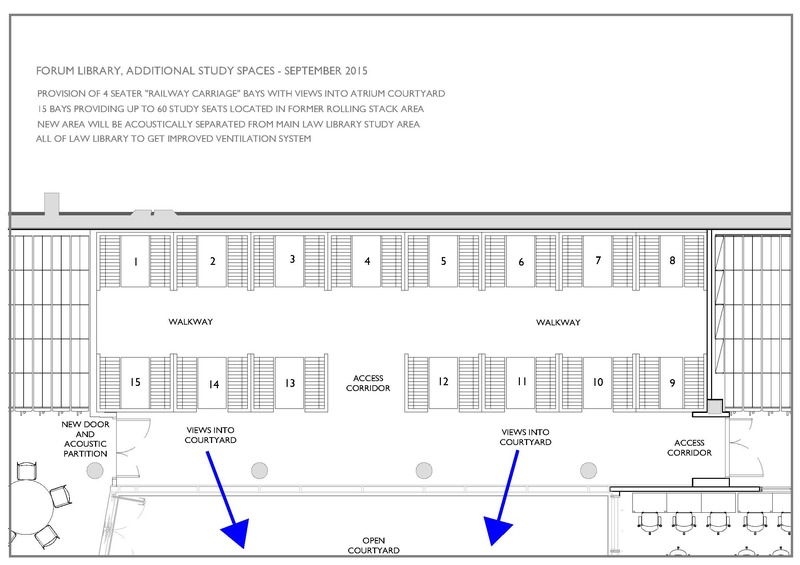 A plan of the new railway style study carrels above and an artists impression below. This entry was posted in Study Spaces on 11th Aug, 2015 by Susan Abbott.